The guide has been developed by Accessible Travel Netherlands in cooperation with two other Amsterdam based companies; Field Factors and Starbikes Rental. The guide was realized with support from Amsterdam Marketing, Provincie Noord-Holland and Nationale Vereniging de Zonnebloem. In the guide users can find short accessible routes through the city, which are visualized with maps. There are 5 routes in total and the routes include accessible restaurants, museums and other points of interest. Additionally, the guide gives information about the accessibility of transport options and the shopping streets. 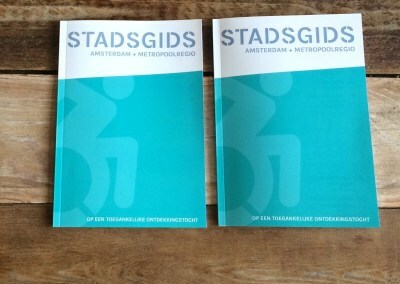 The guide is meant for all visitors to Amsterdam, however especially developed for those who experience limited mobility. The routes are shorter than usual routes, which make them easier to complete. The routes go past many restaurants for regular stops to rest or to relax.